Maggie is a dental hygienist with an exceptional reputation and over 50 years experience within the dental profession. She has had a number of articles published in many professional publications and international journals. She lectures throughout the UK, and overseas and regularly receives referrals for the more difficult, non-surgical periodontal (gum) treatments from other dental practices. The VisionPerio Interdental Brush was born from Maggie’s idea that patients should be able to control much of their own gum disease by removing the bacteria (plaque) that caused it. Her experience with patients who have periodontal disease (gum disease) led her to spending several years researching how this destructive disease could be stabilised. It was her study at the Dental Hospital at Leeds University that tested her method of disease control. She compared the use of a curved interdental brush to other methods available on the market to reduce all symptoms (parameters) of disease before professional therapy. Maggie’s results were conclusive – changes in the method of interdental cleaning with a curved brush could reduce plaque, pockets and bleeding without any extensive treatment. This research led on to specifying each element of the VisionPerio Interdental Brush we have today which include the pre-curved brush head that cleans deep into the interdental space, the coloured filaments that are firm and don’t crush and spring back in use, the long brush head for a single pass without scrubbing, in a choice of sizes to achieve a close fit and optimum clean, whether there has been early or advanced bone loss between the teeth, a very strong fine wire that does not bend and break (like others), to the easily identified coloured bristles which show plaque and debris removed. The VisionPerio brushes feature as the ‘gold standard’ of interdental cleaning in dental hospitals and periodontal specialist practices. Maggie has received awards for services to the practice of dental hygiene and periodontal research. She is the first and only dental hygienist who has been awarded an MPhil qualification in Periodontology (2003), the branch of dentistry that deals with oral hygiene, and the health of gums and bone around the teeth. 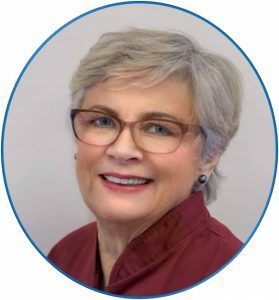 She has over 30 years of experience in treating periodontal diseases with specialists who believed in curing periodontal breakdown by empowering patients, without surgery where possible. To make this kind of treatment accessible for more patients, she opened her own ‘Direct Access’ hygiene practice in north Manchester. Maggie continues to work with specialist and refers patients on if they require a wider scope of care. Ask your Dentist or Hygienist about VisionPerio Interdental brushes or order on line from this website.